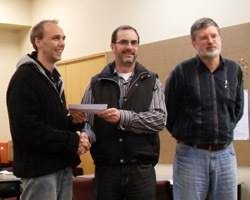 Open - 1 Bob Smith $750 2 Paul Garbett $500 3 Anthony Ker $400 4 Mike Steadman $300 5 Gino Thornton $200. Under 2000 - 1 Antonio Krstev $400 2 Edward Lee $300 3 Martin Hill $200 4 Noel Pinic $100. 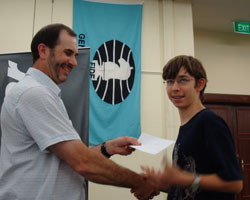 Under 1700 - 1 Alan Ansell $350 2 Hans Gao (taking 1st Junior prize) 3 Leo Guico (taking 1st U1400 prize) 4 Philip Mukkattu $250 5 Viv Smith (taking 1st Female prize) 6 Bob Mitchell (taking 2nd Senior prize) 7 Jim Cater $150 8 Neil Cruden (taking 3rd Senior prize) 9 William Li (taking 2nd U1400 prize) 10 Boyd Siripornpitak $75. Under 1400 - 1 Alan Ansell (taking 1st U1700 prize) 2 Hans Gao (taking 1st Junior prize) 3 Leo Guico $300 4 William Li $200 5 Edward Rains $100 6 Timothy Rains $50. Junior - 1 Hans Gao $300 2 Daniel Shen $200 3 Alan Ansell (taking 1st U1700 prize) 4 Sue Maroroa $100 5 William Li (taking 2nd U1400 prize) 6 Mario Krstev $50. 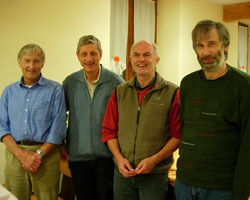 Senior - 1 Peter Stuart $300 2 Viv Smith (taking 1st Female prize) 3 Bob Mitchell $200 4 Neil Cruden $100 5 Jim Cater (taking 3rd U1700 prize) 6 William Lynn $50. Female - 1 Viv Smith $300 2 Jiapeng Li $200 3 Cathy Fan $100 4 Nicole Tsoi $50. Under 14 & Under 1400 - 1 Hans Gao (taking 1st Junior prize) 2 Alan Ansell (taking 1st U1700 prize) 3 William Li (taking 2nd U1400 prize) 4 Winston Yao $150 5 Ryan Lee $100 6 Leo Zhu $50. 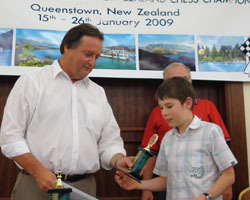 Prizes will be presented at the NZ Chess Congress from 7pm on January 12, at the Alexandra Function Centre, Lyell Creek/Owners & Trainers Lounge, Greenlane Rd, Greenlane. December 5th-12th 2009 - Australasian Masters 2009 , Melbourne, AUSTRALIA. 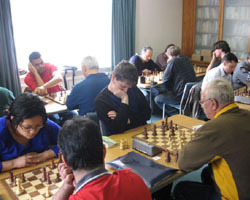 Solomon 6½; Morris 6; Cheng, Johansen, Levi 5; Dragicevic, Nokes, Teichmann 4½; Lee 3½; Dizdarevic ½.
December 5th 2009 - MIT Open, Auckland. 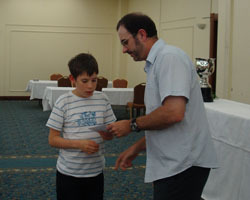 November 30th-December 1st 2009 - Australian ChessKids National Interschool Championships Finals, Australia. 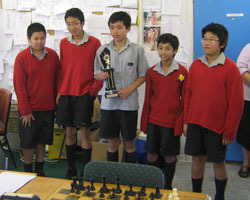 1st in Secondary Finals: Auckland Grammar (New Zealand). Individual results: Daniel Shen won the silver medal on tiebreak after finishing equal first with Laurence Mathieson (Carey Grammar) on 6½/7. 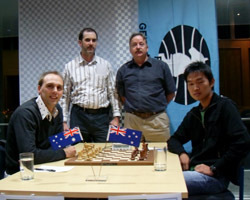 Michael Wu 5½; Lion Yang, Sam White 5; Yufei Chen 4½ (75 players in total). 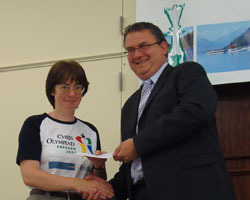 In the Intermediate section, Somerville were second (out of 7 teams). Individual results: Luke Li of Somerville won the gold medal on tiebreak after finishing first equal with Isaac Ng (Brighton Grammar) with 6/7. Leo Zhu 4½, Shivin Mosa, James Lee 4, Sai Nacker 2. In the Primary section, Milford Primary finished 8th out of 24 teams. 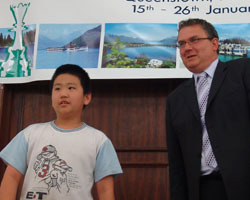 Individual results: Winston Yao 5, William Zhang 4½, Bella Qian, John Jiang 4, William Kelly 3 (125 players in total). 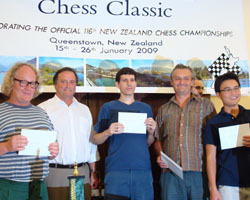 November 28th-29th 2009 - Hawkes Bay Chess Championship and Blitz Championship, Napier. 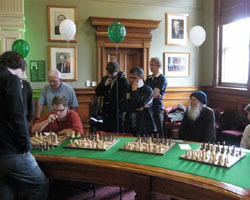 November 28th 2009 - Simul by GM Gawain Jones, Museum of Wellington City & Sea. 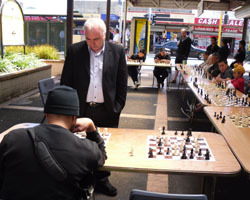 GM Jones faced perhaps his toughest NZ Simul in Wellington: 23 players - with 7 players over 2000 including the current NZ Champ IM Anthony Ker (2423) and FM Nic Croad (2332). Wins for IM Anthony Ker and Romeo Rabina. 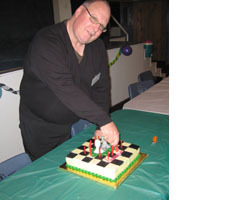 See the Wellington Chess Club website for more photos and information. Some of the games are available for download here (pgn file). Thanks to Justin Davis for providing these. 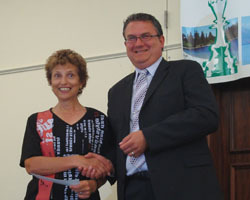 Some photos of the event, thanks to Justin Davis and Sue Maroroa. Gawain Jones Nic Croad (foreground) and Anthony Ker. November 22nd 2009 - Wellington Rapid, Wellington. Some photos of the tournament, thanks to Justin Davis. November 21st-29th 2009 - University of Texas at Dallas GM Norm Invitational Tournament, Texas, USA. 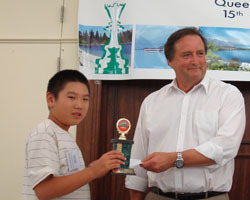 A fine result for Puchen Wang, who finished 4th on 5/9, behind GM Zviad Izoria & GM Giorgi Kacheishvili (both Georgia) on 6/9 and GM Alejandro Ramirez (CRC) on 5½. It was a 10-player all-play-all with a total of 4 GMs and 6 IMs. November 11th-23rd 2009 - World Youth Championships, Antalya, TURKEY. 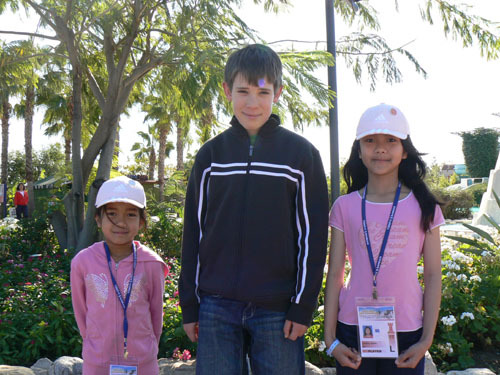 Alan Ansell (under-12 Open) 6/11 (placed 44-62 out of 142 players); Nurul Izzah Halim Shuhaimi (under-10 Girls) 3½/11; Nurul Farhana Halim Shuhaimi (under-8 Girls) 3½/11. 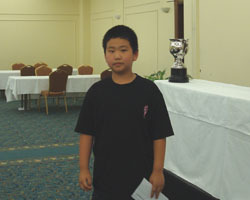 Congratulations to former kiwi Bobby Cheng, now playing for Australia: he won the under-12 Open outright with 9/11. Left to right: Farhana, Alan, and Izzah (thanks to John Ansell for the photo). November 11th 2009 - Pete's Bishop Napier vs Hastings Match, Hastings. 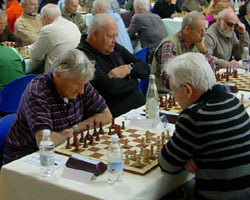 October 27th-November 8th 2009 - World Senior Chess Championships, Condino, ITALY. See http://www.arcoworldchess.com/ for live games and results. 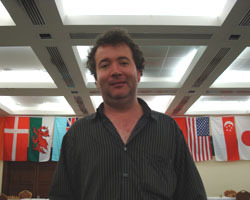 Peter Stuart (seeded 87) 6/11 finished in 57-76th place; Nigel Cooper (seeded 155) 4½/11 finished in 122-139th place. Some photos of the tournament, thanks to Nigel Cooper. 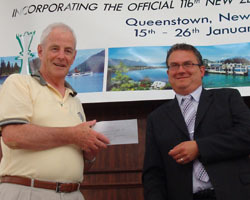 (Denmark) and Peter Morris (Ireland). Nigel Cooper in a tight end game. 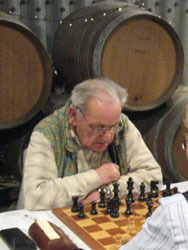 Peter Stuart (playing black). 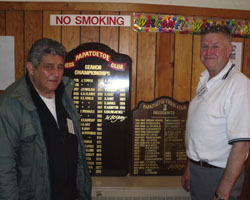 October 24th 2009 - Papatoetoe Chess Club's 75th Anniversary Celebration, Auckland. 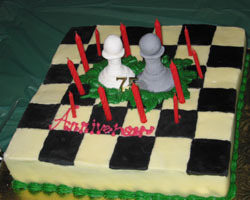 The anniversary cake. Simultaneous display by Leonard McLaren. Graham Banks cuts the cake. October 24th-26th 2009 - 2009 All Canterbury Championships, Christchurch. 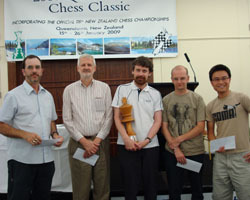 Full results and game download at the website, http://www.chess.org.nz/allcanty2009.html. 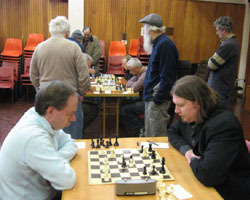 October 23rd-26th 2009 - Merv Morrison Memorial Chess Tournament, Auckland. 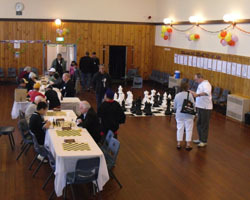 October 16th 2009 - Hastings District Junior Chess Tournament, Hastings. 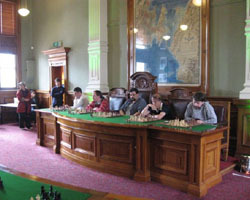 Run by the Hastings and Havelock North Chess Club and the Hastings District Council. October 11th 2009 - Pete's Bishop Napier vs Hastings Match, Napier. 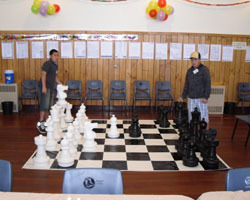 October 5th-7th 2009 - 2009 Auckland Junior Chess Championship, Auckland. 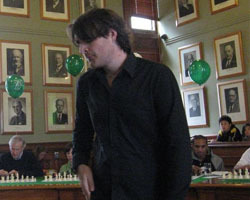 After the completion of the tournament, English grandmaster Gawain Jones gave around 50 kids and adults a very interesting and instructive lecture about some sharp openings, middlegame ideas and endgame techniques. 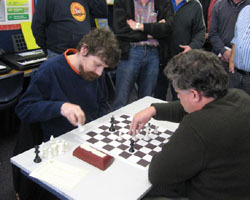 October 5th 2009 - Simul by Gawain Jones, Auckland Chess Centre. 24 players braved the weather, about half of these being regulars in the club's A- or B-Grade competitions. Gawain's result: +21 =3 -0 in just on 3 hours. 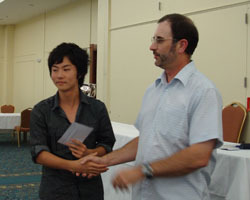 Draws for A-Grade opponents Daniel Shen (both players were winning at some stage), and Don Eade. Also a winning draw for Massey High student Brogan Powlesland, using the King's Gambit (Gawain allowed players to choose the white pieces - few accepted, for some strange reason). Near misses for Hugh MacLeod and Jiapeng Li, among a few others. September 26th-October 4th 2009 - George Trundle NZ Masters Tournament, Auckland. 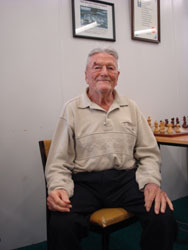 Sponsored by the Auckland Chess Centre and avid local enthusiast George Trundle. Players: GM Gawain Jones ENG 2553, GM Darryl Johansen AUS 2477, IM Stephen Solomon AUS 2424, FM Bob Smith NZL 2298, FM Tim Reilly AUS 2288, FM Nic Croad NZL 2285, Ralph Hart NZL 2256, FM Bruce Watson NZL 2256, FM Mike Steadman NZL 2252, FM Stephen Lukey NZL 2233 (September 2009 ratings). Concurrent closed 9-round all-play-all Qualifiers' event: Daniel Shen 2125, Bruce Wheeler 2077, Peter Stuart 2074, Hilton Bennett 2036, Nathan Goodhue 2018, Bob Gibbons 1992, Edward Tanoi 1967, Bill Forster 1955, Helen Milligan 1955, Richard Taylor 1942. Download pgn games file here (rounds 1-9). 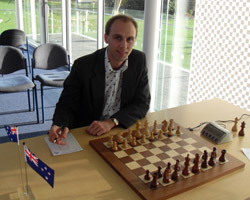 See more photos at the Auckland Chess Centre website. 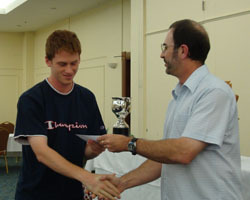 IM Event: Jones 7½; Johansen, Solomon 6; Steadman 5 (Best New Zealander trophy); Watson 4½; Lukey 4; Smith, Reilly 3½; Croad 3; Hart 2. Qualifier: Shen 6½; Wheeler 6; Bennett 5½; Milligan 5; Gibbons 4½; Forster, Goodhue, Tanoi 4; Stuart 3½; Taylor 2. 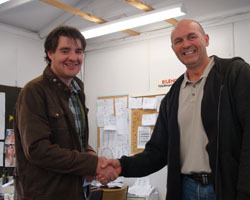 Gawain Jones receives his prize. 2nd= Solomon & Johansen. Best New Zealander Mike Steadman. 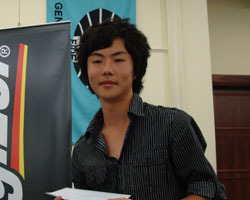 Daniel Shen, winner of the Qualifiers. 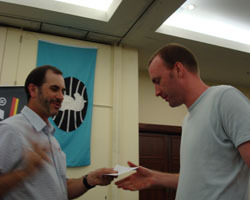 Bruce Wheeler , 2nd place. George Trundle, sponsor. 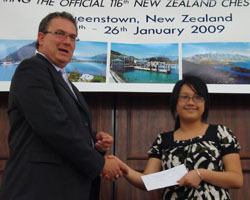 September 26th-27th 2009 - National Interschool Finals, Palmerston North. 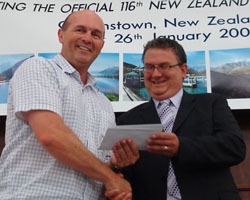 Full results are available on www.sims.net.nz, the website of the organiser, Martin Sims. Place Name          Loc  Score Buch. Berg. Place Name          Loc Score Buch. Berg. Place Name           Loc  Score Buch. Berg. 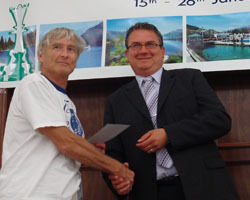 September 24th-October 2nd 2009 - World Youth Olympiad, TURKEY. 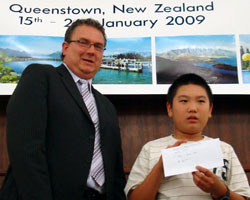 New Zealand was represented by Hans Gao, William Li, Sean Tang and Xing Hua Michael Zheng. They were seeded 19th out of 22 teams and finished 20th. September 24th-28th 2009 - 2009 Solomon Islands International Chess Championship, SOLOMON ISLANDS. September 20th 2009 - Kapiti Rapid, Kapiti. August 29th-30th 2009 - North Shore Open. B-grade: 1st Leonides Guico 5/5; 2nd= Hans Gao & Xiang Wei Li 4. 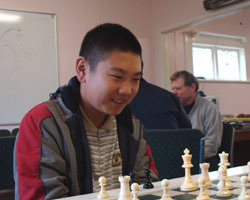 Junior: 1st Luke Li 4½/5; 2nd= Harry Cui, Henry Jiang & Scott Yang 4. 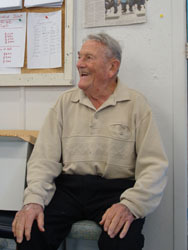 August 29th 2009 - Gordon Hoskyn Memorial Rapid, Palmerston North. 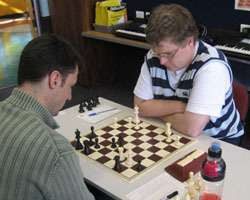 August 28th 2009 - Auckland Primary and Intermediate Chess Championship Finals, Auckland Chess Centre. Intermediate: 1st Rangeview 16½/20; 2nd Somerville 15; 3rd Murrays Bay 12/20. 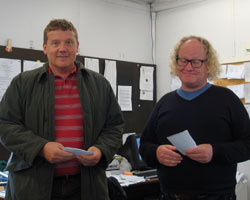 Primary: 1st= Blockhouse Bay and Milford 15/20; 3rd Hillsborough 12/20. 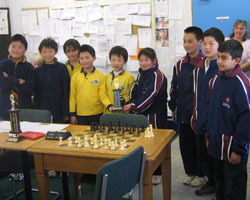 August 7th 2009 - Hawke's Bay Regional Inter-School Teams Chess Tournament. Secondary: 1st Napier Boys' High School; 2nd Napier Boys' High School; 3rd St John's College. 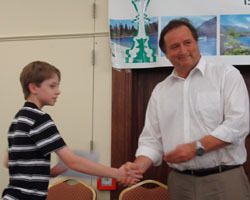 Intermediate: 1st Tamatea Intermediate School; 2nd Hastings Christian School; 3rd Havelock North Intermediate. Primary: 1st Nuhaka School; 2nd Peterhead School; 3rd Hereworth School. 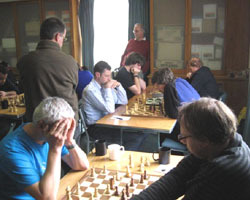 August 7th-9th 2009 - Waikato Chess Open, Hamilton. 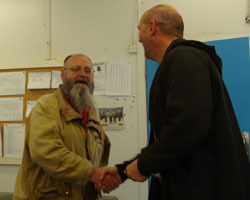 David Smerdon receives his prize from Paul Spiller, with tournament organiser Hilton Bennett. 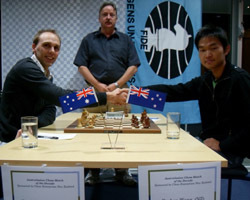 August 1st-6th 2009 - Australasian Chess Match of the Decade: Puchen Wang versus David Smerdon, Auckland. 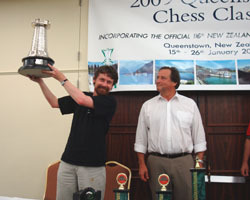 Sponsored by Chess Enterprises New Zealand. Venue: "Old Boys' Pavilion" at Auckland Grammar School in Mountain Road (off Khyber Pass). Six game match, one game a day, starting at 4pm. Time control: 100 minutes for all the moves plus an increment of 60 seconds from move 1. Spectators welcome. Live coverage via the Match Page. 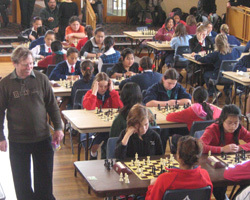 July 29th 2009 - Auckland Girls Chess Championship, Auckland. It was a great turnout with 132 girls playing in the 3 age-group tournaments. A big thank-you to all schools participating in this event. 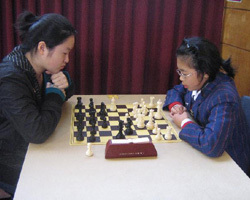 July 27th 2009 - Girls' Individual Chess Championship, Christchurch. 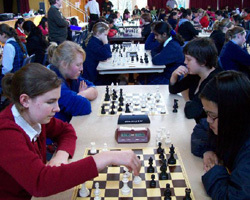 July 22nd 2009 - Girls' Team Interschool Competition, Christchurch. 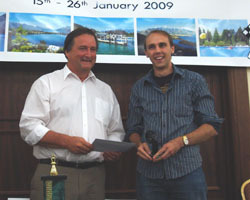 July 11th-14th 2009 - South Island Championship, Dunedin. 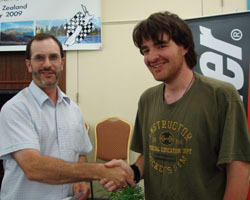 Nic Croad of Wellington won the event, and the 2009 South Island Champion is Peter Fraemohs of Canterbury. 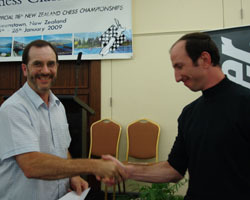 July 10th 2009 - South Island Rapid Championship, Dunedin. 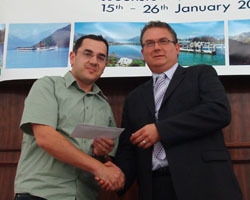 1st= Arie Nijman (South Island Rapid Champion, pictured) and Nicholas Croad. 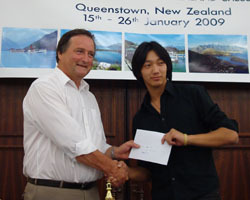 July 7th-10th 2009 - New Zealand Junior Championship, Auckland. 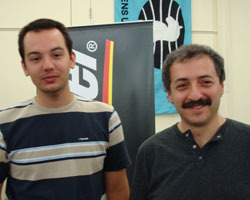 1st= Andy Chen and Alan Ansell on 6½/7. 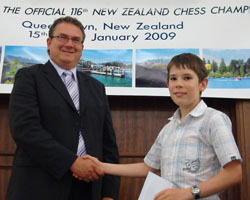 July 6th 2009 - New Zealand Junior Rapid Championship, Auckland. June 27th 2009 - Upper Hutt Open "25 + 5" Tournament, Upper Hutt. June 18th-July 6th 2009 - Palmerston North Club Rapid, Palmerston North. 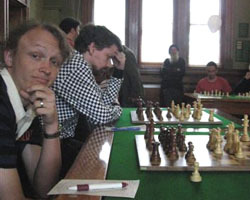 "A suprise win in the last round by Taylor over King saw a 3-way tie for first, and a fanastic result for Taylor!" 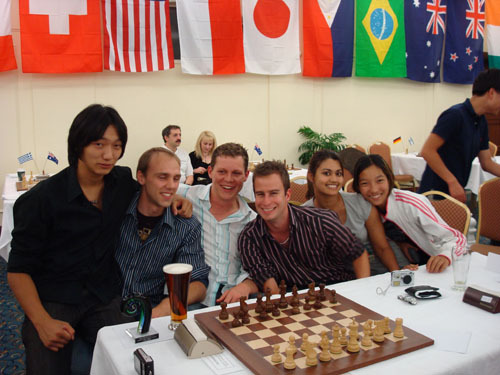 June 20th-26th 2009 - Oceania Zonal Chess Tournament, Gold Coast, AUSTRALIA. 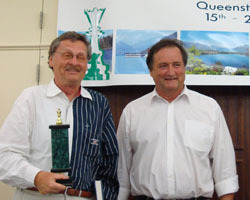 Website: www.gardinerchess.com/oceaniazonal/oceaniazonal2009.htm Venue: Visions Conference Room, Outrigger Twin Towns Resort, Tweed Heads, Gold Coast, Australia. Congratulations to Mike Steadman, equal second in the Zonal, who gained the FM title, and Sue Maroroa, third in the Women's, who gained the WIM title. 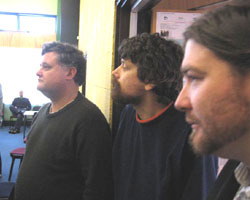 Other kiwi scores: Robert Smith and Paul Garbett 5½; Mario Krstev and Antonio Krstev 4½; Paul Spiller, Helen Milligan and Hilton Bennett 4. Other kiwi scores: Judy Gao 5, Viv Smith 4½, Natasha Fairley 4, Nicole Tsoi 3½. Photo: Judy Gao (left) and Arianne Caoili. 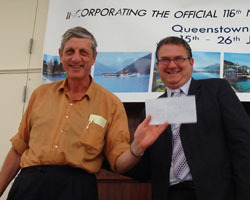 Congratulations to organiser Graeme Gardiner and the Gold Coast Chess Club for a successful event. June 6th-7th 2009 - Westfield Pakuranga Junior Chess Tournament, Pakuranga, Auckland. 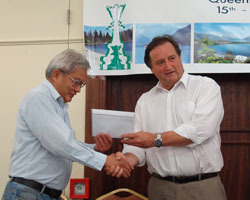 Won by Hans Gao and William Li. Place Name                         Loc  Score M-Buch. May 30th-June 1st 2009 - 32nd Waitakere Licensing Trust Open, Auckland. 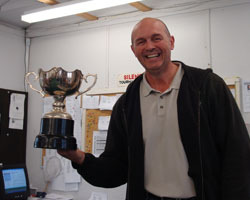 English Grandmaster Gawain Jones duly won the Open, with a perfect 6/6. 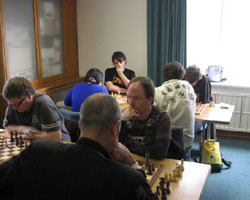 May 21st-28th 2009- Palmerston North Chess Club 10/10 Tournament, Palmerston North. May 8th-10th 2009- NZ Seniors Championship, Hamilton. 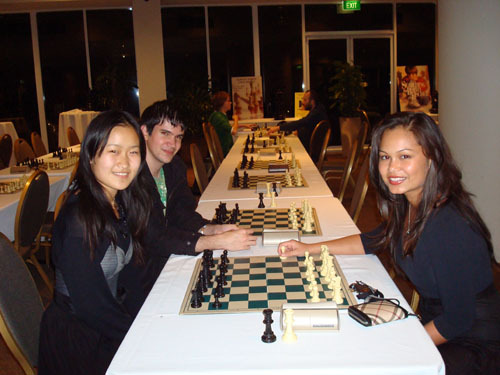 April 21st-25th 2009 - New Zealand Women's Chess Championship, Auckland. 1st Judy Gao 4.5/6, 2nd Nicole Tsoi 4/6, 3rd Vivian Smith 3/6, 4th Jiapeng Li 0.5/6. Reserve section: double round-robin rapidplay, with 6 players. 1st Cathy Fan 8.5/10, 2nd Katy Qiu 8.0, 3rd Judy Zhu 7.5, 4th Olivia Dong 4.0, 5th Eva Shu 2.0, 6th Hannah Francombe 0.0. April 14th-19th 2009 - Parramatta Chess Festival, AUSTRALIA. 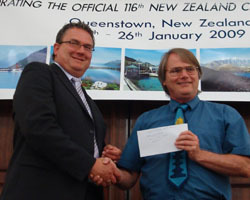 Kiwi results: Mike Steadman, Hilton Bennett 5/9; Bob Gibbons, Bill Forster 4/9; Helen Milligan 3/9. April 10th-13th 2009 - 2009 North Island Championship, Wellington. April 9th-30th 2009 - Palmerston North Club 60/60 Tournament, Palmerston North. After a close call in the last round, Mathew King won the event with a perfect 5 out of 5. More information and games at kiwichess.blogspot.com. 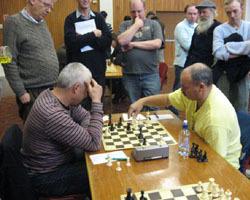 April 5th 2009 - North Island Rapid Championship, Hamilton. 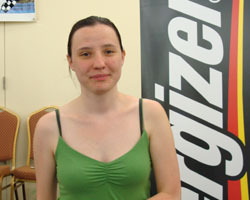 5th-11th J. Duneas, H. Marko, D. Eade, R. Dare, E. Green, R. Gibbons, I. Semerdzhiev (4)… 36 players. 4th D. Kyle (4.5) … 19 players. March 27th-29th 2009 - Auckland Chess Centre Weekender, Auckland. March 19th 2009 - Palmerston North Club Blitz Championship Final, Palmerston North. Semi-finals (best of 5): A stunning performance by Holdaway and Taylor versus the much higher rated Club Champion (King) and the Club's Blitz Champion (Davis) who were both almost knocked out. 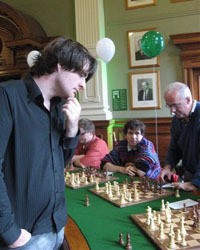 Justin Davis (1968) beat Stephen Talyor (1605) in a sudden-death play-off after the 5-game match was tied. March 15th 2009 - Howick-Pakuranga Chess Club Annual Latvian Tournament, Pakuranga, Manukau City. March 12th 2009 - Palmerston North Club Blitz Championship Qualifiers, Palmerston North. February 28th 2009 - Bay of Plenty 25'+5" Rapid, Mt. Maunganui. Perfect 6/6 for Gino Thornton in the A-Grade and Bob Mitchell in the B-Grade. February 7th 2009 - MIT Waitangi Rapid, Auckland. January 25th-26th 2009 - NZCF Rapidplay and Lightning Championships, Queenstown. 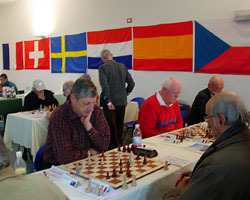 An initial tournament established placings in three separate all-play-all sections. 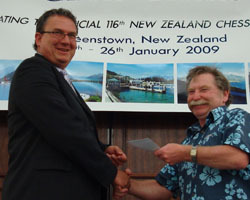 The Lightning prizes were presented by NZCF president Paul Spiller. 1st: Gawain Jones with 8/9. 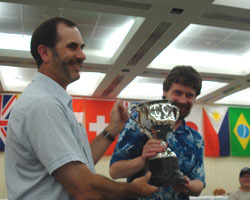 The Rapidplay prizes were presented by NZCF president Paul Spiller. January 15th-24th 2009 - 2009 Queenstown Chess Classic, Queenstown. Download games here (pgn file) - many thanks to Justin Davis for correcting the original file and inputting all the remaining games. IM norms were achieved by: Tim Reilly, Igor Goldenberg, Sam Chow, Domagoj Dragicevic, and Andrew Brown. Note: tiebreaks calculated on fewest number of draws. 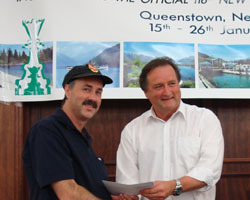 The Queenstown Chess Classic prizes were presented by NZCF Patron, Jim Benson. David Smerdon and his Bratpack. 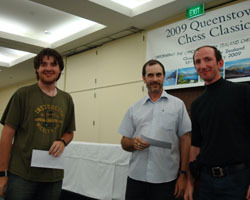 Junior chess classic prizewinners, flanked by Craig Hall (left) and Paul Spiller. 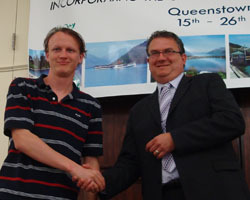 Many of the prizes were presented during the Queenstown Chess Classic by a representative of Millennium Hotels, Simon Boyle.